After more than 2 months of summer holidays, I forgot what it was like to get up early every morning and get my son get ready for school on time. He started school last week. The first week is done. I am exhausted. I am sleep-deprived. I am so glad it's weekend now. I can't wait for their next holidays. In fact, I checked the school calendar: I have to wait two months until they have mid-term break. I'll be a walking zombie by then. The only good thing is that the days are longer. Just after 7am my boys are out of the house. During holidays our day would only slowly start between 8 and 9am. I've got 1-2 hours extra each day, and I can feel it. 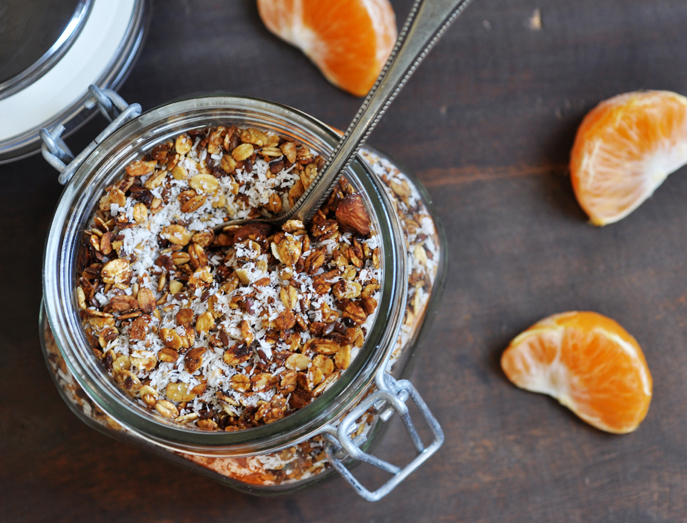 Granola is my staple breakfast, and I never get tired of trying out new flavor combinations. The date harvest season has been in full swing their dark sweet flavor. A bit like molasses. In combination with orange zest you need no more sweeteners or spices. Perfect for my granola. In fact, I stopped adding dried fruit to my granola. By putting flavor onto the oats and nuts, it doesn't require more added sweetness. And what's better in the morning than smells coming from freshly baked breakfast goodies. I'd make this granola just for the smell that comes from the oven. Heavenly. My family, without exception, comes and asks curiously what I am cooking when I have granola in the oven. It's that good. Place dates and orange zest in a bowl. Pour over the boiling water and let stand for 10 minutes. Stir in the olive oil, then puree. In bowl, combine oats, almonds and flax seeds. Add in the date mixture. Stir until dry ingredients are well coated. Spread in a single layer onto a baking sheet. Bake for 25 minutes or until lightly browned. Let cool completely. Stir in desiccated coconut. Store in airtight container.